As the sun comes out we offer up to you a release that stands above the crowd with its beautiful and deep sounds and a groove throughout the entire release that is well suited to any deep house night across the globe. "Got To Be Alert" is the first original track up on the EP from Alfred R, who has been releasing nothing but quality music from his home country Romania. This is a deep uplifting track with a lush soundscape and a touch of vocals snippets to aid you on the journey into the depths of space and time with a rhythm and sway all its own. The remix for this track coming from Mexican based Zeque, who is also the A&R of InfraDig Records, brings the flavor of deep he is known for with a body moving dark grind and a spice all its own, with fresh new vocals and piano that add extra groove. The next original from Alfred is a dreamy and melodic track featuring yet again an exceptional soundscape while slowly driving you down a deep and unique trip into the "Morning Lights". 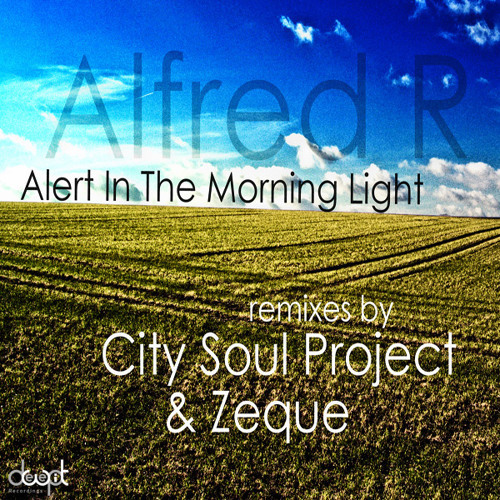 The English gents of City Soul Project, also known for their rising gem of a label Savoir Faire Musique, provide for us a remix that is something both sublime and groovy with its baseline and chords that provide an excellent drive to the track while maintaining a fresh feel. With so much talent overflowing from the producers and tracks that would make any deep house fan's knees quiver, this is a release not to be overlooked. always great tune's on deepwit recordings! support!